Shahab Hosseini and Taraneh Alidoosti star in Asghar Farhadi's THE SALESMAN, a complex, rewarding drama. It's an earthquake: The building shakes, plaster tiles fall from the bedroom ceiling. You look out the cracking window to see what's going on. Then you realize that it's a track hoe digging for a foundation next door that caused your rude awakening. 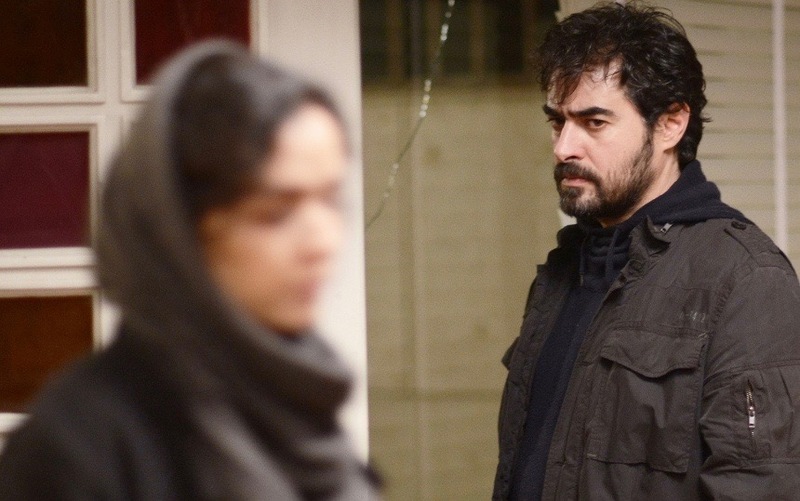 This is how Asghar Farhadi's The Salesman sets up the things to come, rather ominously, from the get-go for a young middle-class, childless couple living in bustling Tehran. Emad (Shahab Hosseini) and Rana (Taraneh Alidoosti) are theater actors who are preparing for their roles in a stage production of Arthur Miller's Death of a Salesman. Their lives are rudely interrupted when their building gets condemned because of that construction snafu. Luckily, one of the cast members has a newly vacated property and suggests that they consider moving in. It's a spacious top-floor apartment but still strewn with other people's belongings. The man says the previous tenant will pick her stuff up soon. Gracious for the offer and desperate to find something fast, Emad accepts the colleague's suggestion despite Rana's misgivings about many personal items still left by the previous tenant. Not long after they move in, Rana is assaulted by an unseen attacker while taking a shower and gets knocked unconscious while Emad is out. She buzzed the assailant in because she thought it was her husband. Physically and emotionally traumatized, Rana is having a hard time coping and has tearful breakdowns while performing in the play. Emad, not trusting the authorities' ability to execute swift justice, starts investigating the matter himself. He is furious to find out that the previous tenant is a prostitute and the Rana's attacker might have been one of her regular johns. He is soon consumed by the thought of revenge as he gets closer to finding out who the attacker was. Just like his award winning neo-realist drama, A Separation, Farhadi is superb at creating tension in The Salesman that plays out like a thriller in its first half. But that part is not the true selling point of the film. The film doesn't end with Emad finding the assailant. The meaty part of the movie only begins after. So this is by no means a spoiler: paralleling the story of Willy and Linda Loman in Death of the Salesman is not Emad and Rana, it turns out, but the attacker, an old man who delivers bread around the neighborhood who had a relationship with the former tenant, and his family who doesn't know his secret. This is where things get interesting. Farhadi's mastery is in his densely layered script. Not only in the way he structures the story within a story with Miller's play, there is also another dimension involving audiences. It seems that public humiliation and making sinners to confront their loved one with the truth is the worst thing that can happen to a person in a socially conservative society. Emad, whose passive, timid personality gradually changes after the home invasion, lets his anger cloud his good judgment. This parallels yet another story, Ingmar Bergman's Shame. The movie's poster for the Bergman's film is visible throughout the film in their abandoned apartment. In it, there is a childless couple. A war changes ineffectual and apolitical husband, played by Max Von Sydow, into a coward and ultimately a murderer. As Emad's zealous pursuit of a punishment for the old man becomes more strained and agonizing to watch, Farhadi is, in effect, putting us the audience in Emad's shoes. Are we really prepared to live with the guilt and shame of the knowledge that we ruined someone else's life, even if the person did us wrong? Both Shahab Hosseini and Taraneh Alidoosti do fantastic jobs as an ordinary couple struggling with the aftermath of a home invasion. The Salesman shows a man's failure to put himself in other people's shoes. Irony is not lost on him being an actor. Farhadi has a real knack for portraying the guilt of ordinary people. The degree of guilt he is showing might be a little too dramatic to pass as a real life. But that degree is small enough to make us uncomfortable. Deeply philosophical with human entanglements, culture, tradition, class and morality, The Salesman is a complex drama with a great narrative pull that is a richly rewarding experience. The film opens in select theaters on Friday, January 27, via Cohen Media Group. Visit the official site for more information. Great review. Thank you. Really looking forward to this. A Separation earned all its accolades and more.